We had heard at CES 2019 that Intel was working to combine it's Optane memory with its solid state storage, and now we've got even more details on the new product that can make even the best gaming PC even better. It may be a mouthful, but the Intel Optane Memory H10 With Solid State Storage looks to do for solid state drives what solid-state hybrid drives (SSHDs) did for traditional hard drives. 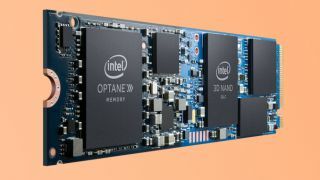 The Intel Optane Memory H10 pairs a chunk of higher speed memory with a considerable piece of QLC 3D NAND flash storage. As QLC NAND lets Intel fit more storage into a small space, it can combine high-capacity NAND with its Optane memory onto a single M.2 drive. In terms of what will initially be available, Intel has listed three SKUs, with a 16GB Optane + 256GB storage, a 32GB Optane + 512GB storage, and a 32GB Optane + 1TB storage. The form factor and high storage capacity make it a compelling option for small form factor PCs and laptops, where drive bays and PCIe slots may be extremely limited and where upgrades to RAM may not be an option either. The new drives are focused on boosting both responsiveness and capacity. The combination of QLC 3D NAND SSD with Intel Optane Memory is furthered along by smart software that can automatically learn your computing behavior to help accelerate your use. If that sounds a lot like what SSHDs do, that's because it's very similar, except with even faster storage and memory. The Optane memory and 3D NAND storage have individual controllers, and the drives boast sequential read/write performance of up to 2,400/1,800 MB/s. 4K QD1 Random read/write speeds hit up to 32K/30K IOPS, which tops the Samsung 970 Evo Plus for write, but not for random read or sequential performance. In many cases, those random read/write speeds improve considerably as the queue depth increases to QD2. Intel identifies a queue depth of QD1 or QD2 as the point where most application workloads operate, so it has highlighted the drives performance in that range. The company claims the new drives offer substantial improvements over the excellent Intel 760p Series SSD in multitasking situations, with documents launching twice as fast and games and large media files launching 60% and 90% faster, respectively. The drives will initially be available in the US in the second quarter through Best Buy OEMs, which includ Dell, HP, and Asus, with more stores and OEMs coming. We've asked Intel about UK and Australia availability details, and will update this piece once we learn more. For system builders, the listed system requirements are 8th-Gen Intel Core U series processors, an Intel 300 Series Chipset On-Package PCH, Intel Rapid Storage Technology Driver 17.2, and a PCIe M.2 slot. It's unclear when they'll be sold individually to consumers, though, or if there will eventually be compatibility with other CPUs and chipsets.